This page lists all reports that for Belgium including those that involve other countries too. Click here for a list of reports that involve only Belgium. diario di una ciclista selvatica. Un racconto vivace che mette a dura prova sia le doti documentaristiche sia quelle tecniche della protagonista ospite di un sito di grande qualità. This is a report of a trip that was intended to be a solo ride from London to Athens over seven weeks. Unfortunately I was involved in a road accident in Germany after only eleven days that curtailed the trip. Before this point I enjoyed fine scenery in such areas as Kent, the Ardennes, Luxembourg and the Black Forest, and passed through many attractive towns including Trier and Vianden. So we Googled cycling options in the Netherlands and the photos of the tulips and windmills were prettier than anything in the catalog. More research indicated that the best time to take advantage of the tulips would be mid-March to mid-May, the only time the Keukenhoff Gardens are open. Also, the second Saturday in May is National Windmill day when all of the Netherland's windmills are open to the public. Tulips, windmills, 7,000 kilometers of cycling routes, Vermeer and Van Gogh, plus cheese, beer and chocolates - we were off to the Netherlands. This was a travel I made in 2008, from Amsterdam to Brugges. This trip was perfect to understand how Holland manages space to give priority for bicycles. We also could count the windmills that were appearing on the way, and fell small near the huge dykes. And, finally, we felt (on the legs) that Holland is really flat. We are two guys from Germany, who travelled across West Europe for two months. With our Performer High Racers, we came through nine European countries (Germany, Czech Republic, Austria, Italy, France, Spain, Portugal, Belgium, Netherland) and crossed both the Pyrenees and the Alps two times each. After 9000 km we finished our tour in August and now we have completed our web page with detailed information for each stage and thousands of photos. The page is in German but offers a integrated translation service. This 1,210 Km (756 mi) tour took us along the Mosel and Rhine rivers into the Netherlands, proceeding then to Belgium and Luxembourg. I had prepared the route with the aid of official GPS tracks of the cycling paths that we wanted to follow. Without the hand-held type GPS, the journey would have required the use of a consistent number of maps resulting in countless wasted time for continuous consultation. Despite the cycling paths are generally signposted they are not present at every turn. At times we found that some were even pointing to the wrong direction - maybe some prankster had fun with them. The tracklog of our entire tour has been recorded and it's available for download. To spare the hassle of changing and recharging batteries continuously, my GPS unit was powered by a small solar station placed atop the handlebar bag. Precious and amazing satellite technology that sadly turns paper maps into romantic memories, it's a luxury I came to love quite quickly. From my home in Holland I have cycled over the Normandy Coast, the Loire Valley and the Auvergne and Cantal regions to Spain for a double coast to coast ride through the Pyrenees. First from east to west through the Spanish Pyrenees. Then from west to east through the French Pyrenees. This journey includes all the famous cols from the Tour de France but also some nice unpaved cycling routes in the Pyrenees. Dutch family cycling on a Hase Pino tandem from Baarn - Barcelona. The kids are 6 and 8 years old. Eine Fahrrad Tour zu den Haupstädten von Europa: Strassburg, Luxemburg und Brüssel. Als Höhepunkte galten die Route des Cretes, eine faszinierende Hochstrasse durch das Elsass in Frankreich; die Route du Vin, die Weinstrasse mitten durch das weitläufige Weinanbaugebiet im Elsass und die vielen Burgen und Schlösser wie Haut Koenigsburg, Beaufort und Vianden in Luxemburg und schlussendlich die Bergregion Ardennen und die Nordseeküste in Belgien. A four month cycle tour by tandem, starting April 2010. The plan, if you can call it that, is to have a good time, eat lots of food and visit some eco projects along the way. We also want to cover some miles in a clean, responsible, but ultimately enjoyable, cheap and stress-free manner. What better vehicle than the bicycle could we use to achieve this? Anyway, this is the blog of our trip. We hope you enjoy the blog and we hope we enjoy the trip. That way, we're all happy. A beautiful bike tour from Belgium to Barcelona (Spain). For me this is the fifth year of touring and the fourth for my wife. 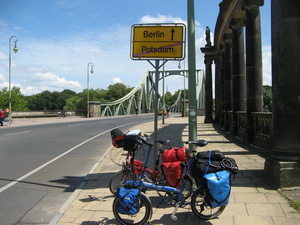 Our site is about the cycle tours we've made through Europe. We've cycled trough nine countries so far (some several times) and hope to visit the rest in the years to come. Enjoy! Voici les photos et une vidéo de ce joli voyage. The shortest way to France from Munich would be about 300 kilometers. We reached the French border after pedaling 2,300 kilometers. On a round-about route we cycled north to Berlin, west to Hamburg and Groningen in the Netherlands and south as far as Rouen in France. By then we had had enough headwinds and rain. Our Bike Fridays, folding bikes, made it possible to continue by train to southern France and finally back to Munich two months later. February is always grim in England and I always dream that March will be better. The days are longer, the bulbs have come through and spring days are on their way. So we decided that March was the perfect time for the first tour of the year - in 9 days we'd cycle from Dunkerque to Germany, north through Belgium and across Holland via the polders. For the tenth year in a row I am doing a medium to large cycling trip. This time I will be staying in Europe. The idea is to cycle through Germany and Austria to southern Italy and Sicily and to cycle back home over Sardinia, Corsica, France and Belgium. 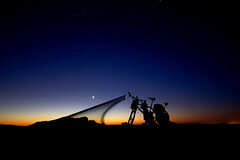 An overall estimate shows me that it will be around six thousand to seven thousand kilometers to fully realise the plan. J'ai fait le tour de l'Europe à vélo en solo durant l'été 2009. J'ai parcouru 12 000km à travers 11 pays. J'ai vécu une expérience magnifique! Venez lire mon blog! We don't just have our house on our bikes, we also have our two dogs, Jack and Paco, along for the ride. That's 60kg of furry luggage and another 50-60kg of non-furry luggage between the two of us! Needless to say we don't go fast but we do go everywhere, refusing to let our extra load stop us from tackling hills with grades of up to 18%. We have been on the road with our two dogs since July 2008. So far we have covered 17,000 kms and 18 countries in continental Europe. Travel By Bike is a website about a group of enthusiastic bikers with more than 10 years of travel experience. From Belgium through The Netherlands, Luxembourg, France, Germany, Switzerland, Italy, Spain, Portugal, Czech Republic, Denmark, Norway, Sweden, United Kingdom. Do not forget look at to the page 'pregnant on bike', reading our travel stories and watching the beautiful pictures! www.velopourvous.com est le site de l'association ``Vélo pour nous, vélo pour vous'', qui à pour but de promouvoir la pratique du vélo. From June 16 to August 1 2008, I cycled from Alta to the North-Cape, there I started a 7-week trip through Finland Sweden Denmark Germany Netherlands Belgium and France back to Switzerland. This is the website and travelogue of The Project VELAIA. 22 year old velosopher, environmentalist and often minimalistic outdoor adventurer Daniel N. Lang has decided to go around the world by recumbent and upright bicycle after finishing an epic journey of more than 17.000km from Paris to Beijing as a rider of the Beijing to Paris 2007 Carfree Rallye, following coastlines for hundreds of kilometers, crossing deserts during mid summer in the Middle East, Central Asia and China and climbing some of the highest passes of the world under extreme conditions in the starting Tibetan winter. After Eurasia he cycled Australia, New Zealand and the United States and is now on a tour through the South American Andes, starting in Caracas, Venezuela and cycling his way down to Chile at the time of writing this (beginning of September 2008). I'm at one of those grave intellectual impasses that have been known to bring even greater minds than my own to a standstill. I have an orphan sock. Trivia, you say. Ha! I think not. The cause of this problem is surely the work of that Slovakian KGB Agent, foolishly disguised as a laundress in Svolen. She stole it, I'm sure. Probably for a DNA sample to impress her superiors in Bratislava. They've been following my every move since the kustoms agent in Warsaw asked me the purpose of my visit to Poland. When I answered ``vacation'' the disbelief on his face gave him away. What, doesn't anyone go to Poland on vacation? But back to the real problem, the orphan sock. The purists among cycle tourists would say, ``Throw it away, it's excess baggage. And while you're at it, cut three inches off that over-long toothbrush handle.'' But the Calvinist in me says, ``Save it. It's a good sock, nearly new.'' I've already reduced the weight of my baggage by losing its mate. Maybe I'll lose another and be back to even and lighter still. Here is a trip that takes me to places I have dreamed about for 35 years. Mountains, Glaciers, Volcanoes and Easter Island. Now includes my 2007 tour of Australia. Read about my adventures by bicycle around the world,taking in Europe, the Near East, India, South East Asia, Australasia, and the USA on Route 66. For something a little less ambitious, I have prepared details of a three-week tour of the beautiful landscapes of central Portugal. Or if you prefer a central base and some day rides, read about my routes on the Spanish island of Mallorca - a cyclist's paradise, with warm weather, flat hinterland, stunning mountain climbs, and huge ice-creams! Journey from south UK to northern Poland on a bike and a recumbent trike. We stayed in Poland for a few weeks and then travelled home via Denmark. We left our jobs and sold our house to go on this trip - part of the reason for going was to explore whether we'd like to live in another country. The other reason was to satisfy my craving for long distance touring. As a rider of the Beijing to Paris 2007 Carfree rallye to celebrate better, carfree mobility (see www.beijingtoparis.com), I am riding in the opposite direction from Paris to Beijing. I try to get in contact with local cycling culture as much as I can and to spread peace over the world! 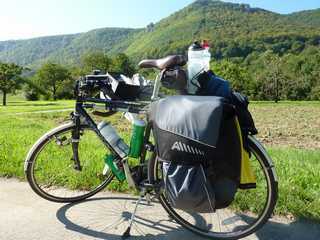 The bike I am undertaking this tour with is a recumbent touring bike equipped with high quality components. So far (end of July 07) I haven't had a single technical defect! We are performing a 2 years (theoretically) trip around Eurasia. During the trip, we are performing a photo documentation for ICOMOS, an expert organization of UNESCO about cultural heritage. The database created will be available on the website. We wish with this project to perform some challenging cycling, linking with useful actions. Our website relates our diary and we are putting plenty of photos and comments (and lots of other fields are going to come, such as advices, technical data...).